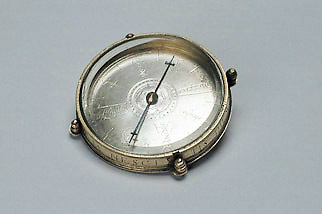 This compass carries on its base a table of the latitudes of fifty-five places. Such tables typically appear on sundials which are adjustable for latitude, and it is possible that this instrument may originally have been part of a larger sundial. Certainly, the four lugs fixed at the cardinal points could have been used to attach the compass to a base plate or ring. The instrument appears to be by the same maker as another unsigned Italian instrument (Epact 24653).